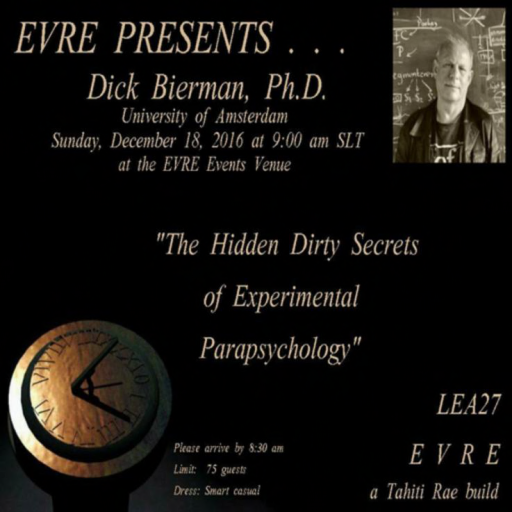 D I C K B I E R M A N, Ph.D.
"The Hidden Dirty Secrets of Experimental Parapsychology"
* PLEASE HAVE ALL MICROPHONES OFF unless you are offered the opportunity by our guest to ask a question. * Please do not left click on our guest's presentation screen! * THANK YOU FOR COOPERATING AND PARTICIPATING! I would again, like to thank the Linden Endowment for the Arts Committee, and Dr. Maggie Larimore, our previous guest speaker on EVRE, for making it possible to host these wonderful guests!